“We are at the beginning of a new chapter in the history of shipping,” said Tian-Bing Huang, Deputy Director – Marine Environment Division at the International Maritime Organization (IMO). In his opening keynote at the global maritime environmental congress (gmec) he instantly caught the attention of the noticeably eager audience in the well-filled conference hall. Organised jointly with Seatrade, the gmec took place for the fifth time this year. There is no question that the shipping sector is facing huge challenges. A main concern is the IMO’s so-called Sulphur Cap, which stipulates that as of 1 January 2020 ship fuels must contain no more than 0.5per cent of sulphur. In addition, the industry is expected to cut its greenhouse gas emissions in half by the year 2050 – in spite of a growing global trade volume. 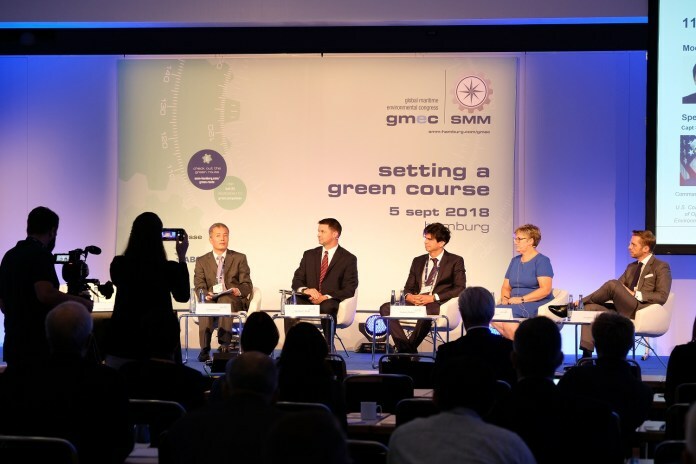 In three different panel discussions, renowned speakers explored the topics “Preparing for Ballast Water Treatment”, “Dealing with the environmental challenges of the future”, and “The passenger shipping industry as an environmental pioneer”, respectively. The conclusion: The ambitious goals are both a challenge and an opportunity. “Our endeavour in this panel discussion is nothing less then solving one of the greatest problems facing mankind – and 90 minutes is all the time we have to accomplish that,” said moderator Teus van Beek (General Manager Market Innovation, Wärtsilä Marine Solutions) in his introduction. His partners in the discussion about the IMO’s climate protection plan and its consequences included Captain Wolfram Guntermann (Director Environmental Management, Hapag-Lloyd AG), Katharine Palmer (Global Sustainability Manager, Lloyd’s Register), Jan-Olaf Probst (Business Director Container Ships, DNV GL – Maritime), Dr.-Ing Gerd Würsig (Business Director Alternative Fuels, DNV GL – Maritime), and Helge Bartels (General Manager, Zeaborn Ship Management). It is a fact that shipping is the ‘greenest’ means of transport even today. The share of ocean shipping in global CO2 emissions is currently 2.2per cent, an amount roughly equivalent to the greenhouse gases emitted by Germany per year. According to forecasts, however, this share is going to grow substantially over the coming years. This is why solutions are needed urgently. “One of the solutions could be LNG. But we are still lacking a functioning infrastructure to deliver LNG directly to the ship,” criticised DNV GL executive Probst. As for shipowners, the stricter emission limits not only translate to enormous extra costs for filter technologies but also imply the need to switch to alternative propulsion technologies in the medium term. “There is nothing we can do to avoid immense capital investments. But taking a look at the rear view mirror should reassure us that we have always been an innovative industry, and we are going to overcome this challenge, as well,” said Helge Bartels from the ship management company Zeaborn. The discussion also addressed the effects of Slow Steaming as well as the opportunities inherent in digitalisation, for example, interlinking smart ships and smart ports. Another core topic of the conference was ballast water management. Roughly one year after the ballast water convention entered into force, the experts at gmec took stock. The discussion panel chaired by Sahan Abeysekara (Technology Lead for Ballast Water Management at Lloyd’s Register) included keynote speaker Huang as well as Capt. Sean T. Brady (Commandant, U.S. Coast Guard Office of Operating and Environmental Standards), Debra DiCianna (Senior Compliance Engineer, Choice Ballast Solutions), Stamatis Fradelos (Director Business Development, ABS), and Tim Wilkins (Environment Director at Intertanko). The participants agreed that there is no ‘one-size-fits-all’ system for all ships but that the range of available systems had evolved considerably. It is important for shipowners to receive more support in both, selecting the right systems and operating them. “There is a host of small details that must be taken into consideration. For example, it is important to understand the details in the type approval certificates for the ballast water management system (BWMS),” said BWM expert DiCianna. “It is essential that information is exchanged to overcome the technical and regulatory issues the industry is encountering on a daily basis“, said Tim Wilkins. The passenger ship segment has taken the lead in environment protection. Under the chairmanship of Andreas Chrysostomou (Chief Strategy Officer, Tototheo Maritime), Lex Nijsen (VP Head of Four-Stroke Marine, MAN Energy Solutions), Jan-Erik Räsänen (Head of New Technology, Foreship), Rolf Sandvik (CEO, The Fjords), Bud Darr (EVP Maritime Policy and Government Affairs, MSC Group), and Tom Strang (SVP Maritime Affairs, Carnival Maritime and Chairman, CLIA Europe Environment, Safety & Security Comittee), discussed current and future challenges. “We are facing an unbelievably huge task, and I have no idea how we are going to solve it. Nobody knows. But this is the kind of situation in which an industry can surpass itself. The most important thing is that we begin addressing it now. And that we do it together,” warned MSC CEO Bud Darr, encouraging the industry to stand together. But there is light at the end of the tunnel: Numerous ferries operate with hybrid propulsion systems, and many ships use shore power while berthing, or LNG barges to supply the power they need during their port stay. Just a few weeks from now, AIDAnova will be commissioned as the world’s first cruise ship operating nearly 100per cent with liquefied natural gas (LNG), and many more LNG-operated cruise ships are on order. Another highlight was presented by The Fjords CEO Rolf Sandvik. His company has developed a passenger vessel for 400 people that is clean, efficient and quiet – the ideal design for cruising the pristine waters of Norway’s fjords. It was informative, stirring and encouraging – the gmec 2018 conference presented the audience with an expert assessment of the current situation as well as an impression that the maritime community is poised to take action. Climate and environment protection are among the themes of this year’s SMM, as well, especially in Hall A5 which is entirely dedicated to Green Propulsion. In addition, the “Green Route” guides visitors to the stands of exhibitors presenting eco-friendly technologies.